Allied with: King Edward's Horse (The King's Overseas Dominions Regiment). Extracted from RK Peacock, Evolution of Australian Light Horse Regiments 1841-1935, p. 13. The Present regiment sprung from the Melbourne (Metropolitan) and the Southern (Dandanong) troops of the Royal Volunteer Cavalry Regiment raised in 1862. Through the years 1863 to 1874, these troops formed part of the Prince of Wales Regiment of Light Horse (Hussars). On the formation of the Victorian Mounted Rifles the Melbourne and Dandanong troops, although not identical, became identified with that organization, and carried on as such till 1903. 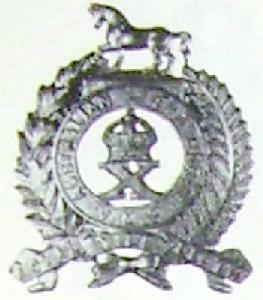 On the Federal re-organization of 1903, the Sale, Moe, Thorpdale and Warragul detachments of the Victorian Mounted Rifles, together with the Sale, Stratford, Rosedale, Cowwarr, Morwell, Wairagul Drouin and Dandenong detachments of the Victorian Rangers were formed into a mounted regiment and styled 10th Australian Light Horse Regiment (Victorian Mounted Rifles) with numbers 1 to 4 Squadrons. This regiment in 1903 had an additional squadron attached known as the No. 5 Squadron raised from the Melbourne, Pakenham and Lilydale detachments of the Victorian Mounted Rifles. Also attached as No. 6 Squadron was a squadron of mounted men formed from a volunteer unit raised in 1900 and known as the Melbourne Cavalry. In 1912, the 10th Australian Light Horse Regiment and the attached squadrons united and all became the 13th Light Horse (Victorian Mounted Rifles). During 1913 the territorial title was allotted to it and the regiment became the 13th (Gippsland) Light Horse it continued as such until the year 1921 when the 13th together with part of the 2/3rd Pioneer Regiment were formed into the 13th Light Horse Regiment ( Gippsland Light Horse). The Sale, Stratford. Rosedale, Cowwarr, Dandenong, Morwell, Warragul, and Drouin Detachments of Victorian Rangers, together with the Sale, Moe, Thorpdale, and Warragul Detachments of Victorian Mounted Rifles, to be formed into the 10th Australian Light Horse Regiment (Victorian Mounted Rifles). The Melbourne, Pakenham, and Lilydale Detachments of Victorian Mounted Rifles to be formed into one squadron of Australian Light Horse, and attached to the 10th Australian Light Horse Regiment (Victorian Mounted Rifles). This section explores the evolution of the Regiment from its first origins as a Commonwealth formation. Each year maps the movement of men and often locations of the various Squadrons and Troops. To get the flavour of the Regiment, it is best to begin the journey at 1903 and follow though each year till the end. Major William Borthwick, 30 May 1903. Major Navroji Bamanji Gandevia, 30 May 1903. Captain Archibald Lloyd, 30 September 1898. Lieutenant William Allison Blair, 5 July 1900. Captain John Hall, 1 January 1903. Lieutenant GJ Bell DSO, Honorary Captain, Boer War Veteran, 18 April 1903. Major Robert Sillett, 26 October 1900. Lieutenant Joshua Dyson Farrar, 1 March 1899. Lieutenant George Vernon Stephen, 25 September 1891. Lieutenant Charles Stewart, 20 July 1894. Captain Charles Edward Merrett, 8 April 1892. Lieutenant Henry Windle Cleverden Smith, 20 July 1894. Lieutenant William John Whitley Strong, Honorary Captain, Boer War Veteran, 8 October 1897. Captain TF Umphelly, Honorary Major, Boer War Veteran, 25 October 1900. Lieutenant Charles Seafield Ogilvy, 25 September 1891. Lieutenant Alexander Rushall, 24 November 1901. Lieutenant David Blair, 1 July 1903. Lieutenant John Sheaton Gordon, 1 July 1903. Major W Borthwick, 30 May 1903. Captain Charles Seafield Ogilvy, 1 January 1904. Lieutenant David Thomas Jones, Boer War Veteran, 5 March 1904. Second Lieutenant Hampton Alexander Gooch, 1 March 1904. Second Lieutenant Henry Baylis, 1 March 1904. Second Lieutenant Hamilton McDonald Fraser, 6 April 1904. Second Lieutenant James Percival Tulloch, 1 March 1904. Second Lieutenant Norman McLean, Boer War Veteran, 1 March 1904. Second Lieutenant John George Cornish Sutton, 18 April 1904. Second Lieutenant Hugh George Essington Anstey, 17 May 1904. Captain George Vernon Stephen, 21 May 1904. Second Lieutenant Walter Henry Manners McFarlane, 1 March 1904. Second Lieutenant Malwyn Hayley A'Beckett, 1 March 1904. Second Lieutenant David James Wemyes McHaffie, 1 March 1904. Second Lieutenant Edward Fitzgerald, 1 April 1904. Lieutenant Colonel William Borthwick, VD, 24 December 1904. Honorary Lieutenant John George Cornish Sutton, 18 April 1904. Second Lieutenant James Forsyth, 13 January 1905. Second Lieutenant Arthur Haywood A'Beckett, 1 March 1904. Major Charles Edward Merrett, 1 January 1905. Second Lieutenant Osborne O'Hara, 1 April 1904. Captain Alexander Rushall, 1 January 1905. The Honorable William Pearson, MLC. Lieutenant Malwyn Hayley A'Beckett, 1 September 1905. Lieutenant Henry Baylis, 21 May 1906. Lieutenant James Forsyth, 21 May 1906. Second Lieutenant Charles Stanley Bowen, 1 July 1905. Second Lieutenant John Malcolm Borthwick, 15 March 1906. Lieutenant Hampton Alexander Gooch, 1 September 1905. Lieutenant Norman McLean, Boer War Veteran, 1 September 1905. Lieutenant Hugh George Essington Anstey, 1 September 1905. Second Lieutenant Benjamin Ronald, 6 June 1906. Lieutenant Walter Henry Manners McFarlane, 1 September 1905. Lieutenant David James Wemyes McHaffie, 1 September 1905. Lieutenant Arthur Haywood A'Beckett, 1 September 1905. Captain George Steward, 14 August 1905. Lieutenant Edward Fitzgerald, 1 September 1905.